Rotterdam is the second-largest city in the Netherlands, after Amsterdam, being Europe’s largest port. 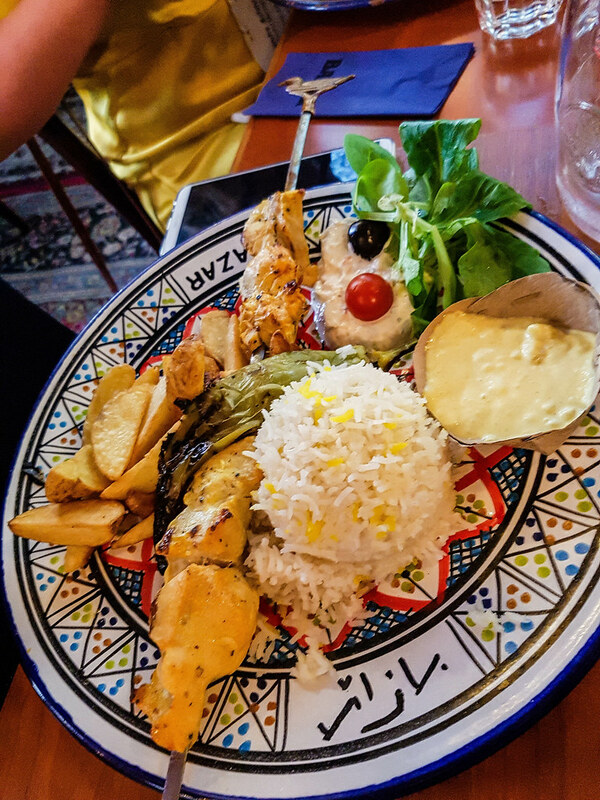 With a large ethnic population, Rotterdam is a very diverse and multicultural city, which makes is as well a foodie heaven. There are so many great restaurants in Rotterdam focused on different cuisines and, during my week stay in the city last year, I was on a mission to try as many as possible. I don’t think I have had a bad meal in the city, the food in Rotterdam being delicious every single time. So, where to eat in Rotterdam? I have created this guide for you with my own personal best restaurants in Rotterdam. Let me know if you have had the pleasure to enjoy a meal at any of them or if you are a local and have other suggestions for me. Where and what to eat in Rotterdam? If you are looking for a café where to have breakfast in Rotterdam, then Op Het Dak Café if the perfect choice. Located on the rooftop of a once abandoned building, this café serves dishes made out of fresh ingredients grown in their own garden. Op Het Dak Café is a unique coffee house in Rotterdam because of the location. During sunny days you can enjoy your breakfast or lunch in the rooftop garden, where they grow organically all the vegetables used in the cooking of the dishes in the restaurant. They also have a bee farm and a herbs garden there. From their menu I can mention the poached eggs in spiced yoghurt served with sourdough, chilli oil, seasonal pesto and herbs ( 8 euros), the farmers bowl in which you will find avocado, yoghurt, fresh fruit, polenta crumbles (8 euros), seeds and almonds and their kimchi rosti’s served with mash and salad (11 euros). As you can see, most of their menu is vegetarian, but they also cater to vegans too. They have dishes in the menu for the meat eaters too, such as the olive roasted cod with lemons, mash, rosemary and veggies (12.5 euros). I visited Op Het Dak Café for breakfast, so I opted for a large cup of coffee and banana bread, served with a sea salt caramel sauce (3.50 euros). The sweet taste and the moist texture reminded me of the banana breads that I used to have for breakfast during my trip to Malaysia. So good! Hudson is an American restaurant with an extensive menu of burgers, wraps, nachos and steaks. They also have a bar where they serve cocktails and Belgian beers. Located very close to the “party street” of Rotterdam, Witte de Withstraat, Hudson is a very good choice if you want to eat before going out. I came to Hudson Restaurant for an event, so I had the pleasure to taste their sharing platters. Filled with chicken wings, onion rings, crispy rolls and, the famous bitterballen, the food did not disappoint. Bitterballen is a typical Dutch snack which consists of deep-fried balls of veal or beef mixed with butter, broth, nutmeg and flour (having the consistency of a soft roux), served with mustard. They are very popular in the Netherlands and you can find them everywhere. In fact, my first meal in The Netherlands was a portion of bitterballen. Gare du Nord is a unique vegan restaurant Rotterdam because it is located inside an old railway carriage. They also have a lovely garden where you can enjoy your lunch on a sunny day. 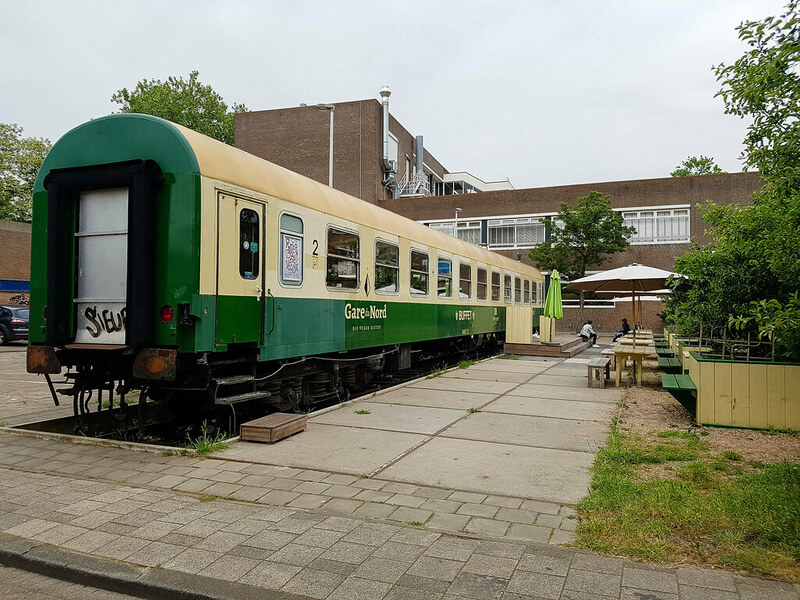 Close to the Rotterdam train station, this is restaurant serves home made dishes made with organic ingredients. They open at lunch time, with a hearty menu from 12Pm until 3:30PM, from which I can mention the best vegan burger in Rotterdam, baked mushrooms, avocado and tomatoes sandwich or the delicious bread with homemade hummus. 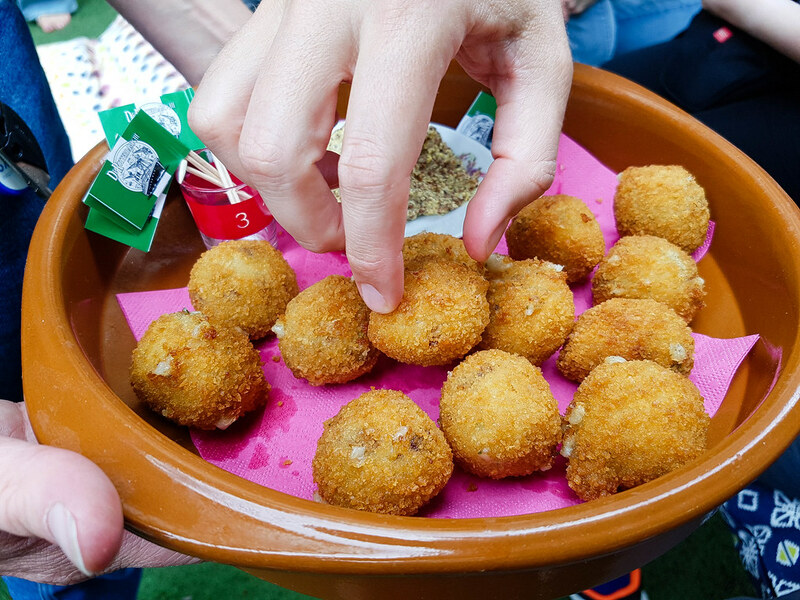 From 3:30PM until 9:30PM they serve snacks and appetisers only, like bread with a selection of three vegan tapenades or the zucchini fritters with tarragon mayo. As good as this vegan restaurant in Rotterdam is, you do need to book ahead and also keep in mind that they do not open every day. Better to check their schedule rather than just show up and be disappointed. Click here for the English translation of their contact page. I have visited the Marriott Hotel a few months before The Millèn Restaurant opened. However, I did participate in a food workshop that included dishes cooked by the Michelin Star Chef Wim Severein, the owner of the restaurant. The food was outstanding and I have been wanting to return to Rotterdam just so that I can have dinner here. The restaurant has earned its first Michelin star just 5 months after the official opening, in July 2018. The menu does change seasonally, but I can mention some of the dishes that I tried, so that you can get an idea of the cuisine style: Low temperature cooked farm egg yolk (63’C), Dublin Bay prawn, oyster, broad beans, kombu dashi, chives and potato chips; Roasted red mullet, tomato, green olive, samphire, fennel, Cantabrian anchovy and basil; Raspberry, Pavlova, dark chocolate ganache, rose petals. When in Rotterdam do keep an eye on the Marriott’s Facebook page as they do organise quite a few foodie events. 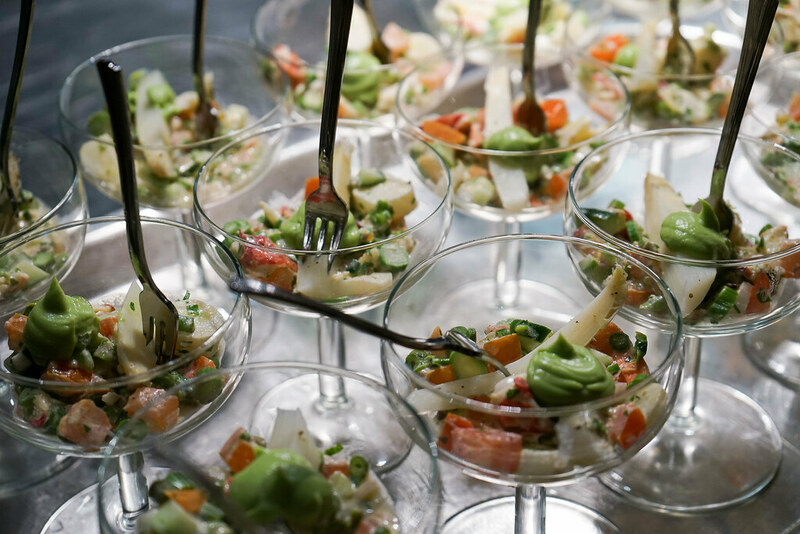 I was lucky to attend the Schmidt Fresh Fish Market, a feast of unlimited fish cooked in 10 different ways, from the classic Rotterdam herring, to Asian style cured salmon and cheesy stuffed grilled lobster. Me and some friends stumbled upon this small restaurant by accident, whilst we were searching for a place to eat. And how lucky we were, as the food was so delicious and the prices very reasonable. Roffa Streetfoodbar is a simple burger joint, with a couple of outdoor tables and a few more inside. The menu is quite small, focused on burgers, hot dogs, smoked barbequed meat and craft beer. Their food is inspired from the BBQ Texas cuisine and Latin America, offering delicious meat sharing platters, ribs and brisket. We all decided that we will order burgers, as we were starving. I went for the cheeky burger, filled with 150 gr of chicken, roasted pepper mayo, swiss cheese, and guacamole. Separate, I also ordered a side portion of handcut fries, which came with a mayo dip. The burger was delicious and juicy, with tender meat and nice balancing flavours. I do love guacamole, and when it’s on a burger, you’d bet I’ll order that. Overall, we were extremely happy with our choice of where to eat in Rotterdam. This restaurant not only that delivered excellent food but also greeted us warmly, with a lovely waiter who couldn’t have been nicer to us. 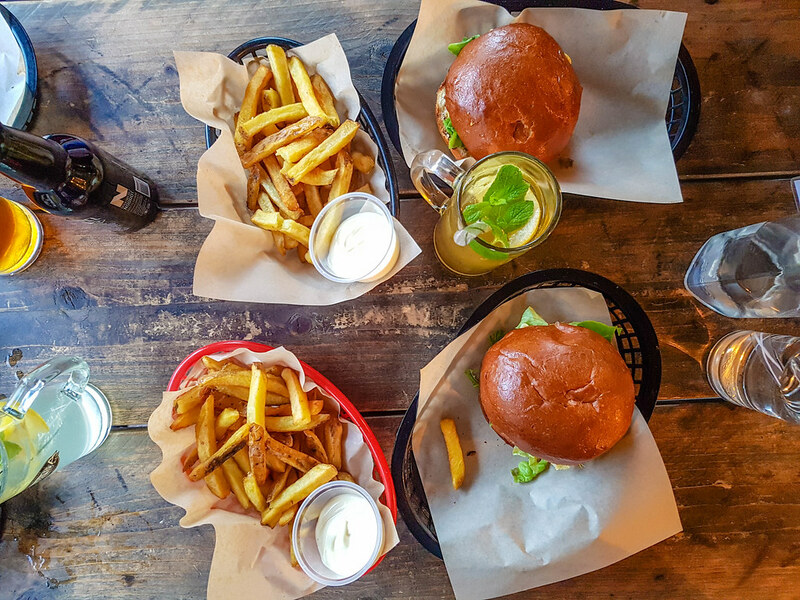 Do they deserve the title of “the best burger in Rotterdam”? Without a doubt, yes! 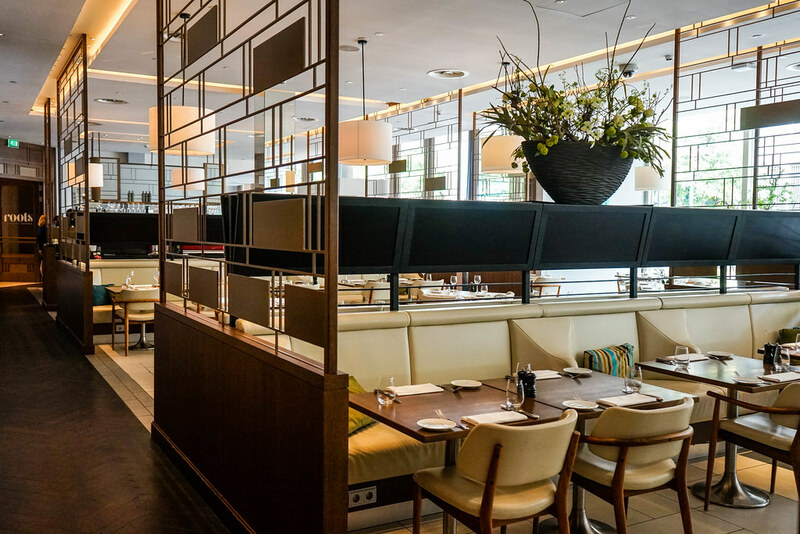 Roots at the Hilton is one of the romantic restaurants in Rotterdam where you can take your loved one for a date night, to enjoy a menu designed for all your senses. Located at the ground floor of the Hilton Hotel, Roots doesn’t only proud itself by using the freshest locally sourced ingredients that come from the local farms in the Netherlands, but also with a special gin and tonic selection, including Monkey 47, Nolet’s Dry Gin and VL92. The gin connoisseurs will know how good these gins are. I personally like Monkey 47 a lot and I don’t see it very often on bar menus. The menu at Roots is quite small and it changes seasonally, based on the ingredients that are in season. This ensures that the food is always cooked to perfection. Quoting from this season’s menu, my choice of a three course meal would be: the oysters with radish, spinach, fennel and gin as an appetiser, the Dutch venison with pear, potato, smoked root vegetables and juniper berry juice as a main, and, for dessert, I would choose the profiteroles with chocolate, whipped cream and Dutch liquor. I have spent a week in Rotterdam but only on my last day I went for dinner at Bazar. Located on the same street as my hostel, I passed by it daily and seen how popular it was with both locals and tourists. Bazar is probably the best Turkish restaurant in Rotterdam! 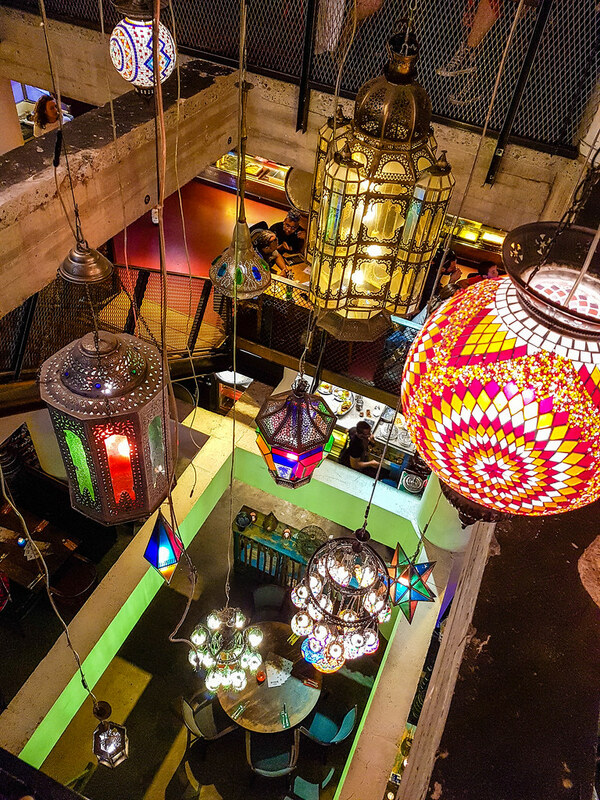 First of all, as I walked it, I was impressed by the décor, with an array of traditional oriental lamps of different sizes and shapes hanging from the ceiling, over two floors. Pretty much like a scene from 1001 Nights! As we were a large party, it was impossible for them to find us a table outdoors, on their terrace, so we were accommodated on the second floor. We really wanted to eat here, and the manager kindly found as a table at which we could all fit (we were around 15!). The menu couldn’t have been more inviting: homemade humus, marinated vine leaves filled with pilau rice and yoghurt dip (sarma), filo pastry filled with feta cheese, mint and parsley (sigara boregi), grilled kebabs (both vegetarian and with meat), marinated veal spare ribs… something for every taste! As a mention, Bazar is a great vegetarian restaurant in Rotterdam as well, a perfect choice if some of your friends are vegetarians and some are not. As I wanted to taste more of their menu, I decided with my friend Sandra that we will order a sharing platter first. We went for the Irfan’s starter (5.90 euros p.p. ), a platter consisting of zaalouk (eggplant and tomato salad), humus, haydari (thick garlic yoghurt with herbs and spices), sarma, peynir ezme (soft cheese with red pepper, olive oil and parsley), sigara boregi and warm bread. For the main course I ordered a vegetarian dish because it sounded so delicious, and because I am a huge fan of feta cheese: the Tepsi Boregi, a baked yufka dough filled with feta cheese, served with salad, haydari, olives, walnuts and fresh herbs (8.90 euros). Having dinner at Bazar was a feast fit for a king, generous portions and dishes full of exotic flavours. SS Rotterdam is a ship that made its first voyage from Europe to New York on the 3rd of September 1959, carrying 1200 passengers on board. Since 1959 until 2000, the ship made numerous transatlantic journeys as a cruise ship. In 2008 it has been docked in the Derde Katendrechtsehoofd quay in Rotterdam, completely renovated, and repurposed as an entertainment venue. On the ship you will find a hotel, bars, restaurants, a wedding venue, event rooms, and even an escape room which I have tried, and I can guarantee is a lot of fun. And no, I didn’t manage to escape in time. 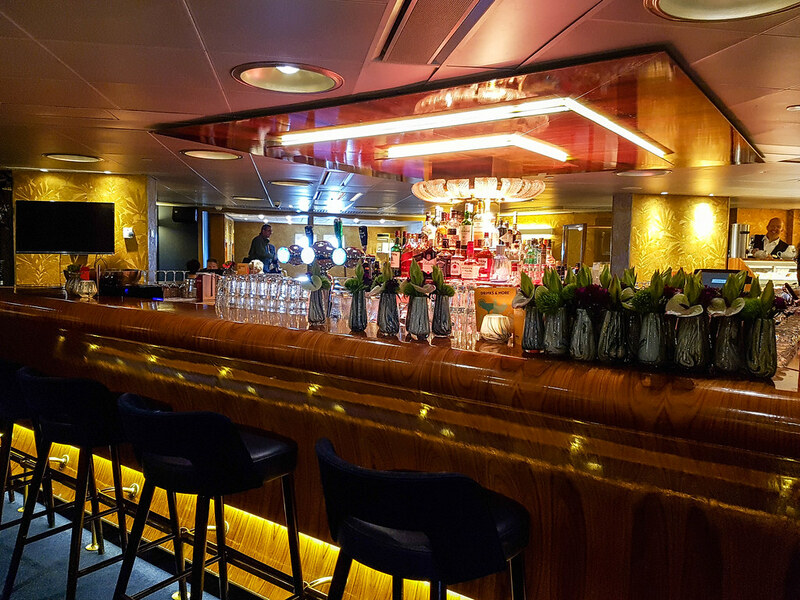 You can visit the SS Rotterdam, you can enjoy a drink or have dinner at the Club Room. However, if you want to experience everything that the ship has to offer, then one of their stay and dine packages would suit best. For 122 euros/person you can enjoy a night in the hotel, a 4-course gourmet dinner with matching wine pairing and a hearty breakfast in the morning. This place has the most amazing collection of hot chocolate in Rotterdam! And with probably hundreds of flavours, it is very hard to pick one… or two… or why not three? It took me a while to decide on mine, but in the end I went for the hotchopspoon of blueberry, honey and roasted thyme, topped with a generous quantity of whipped cream, as hot chocolate should be drank. 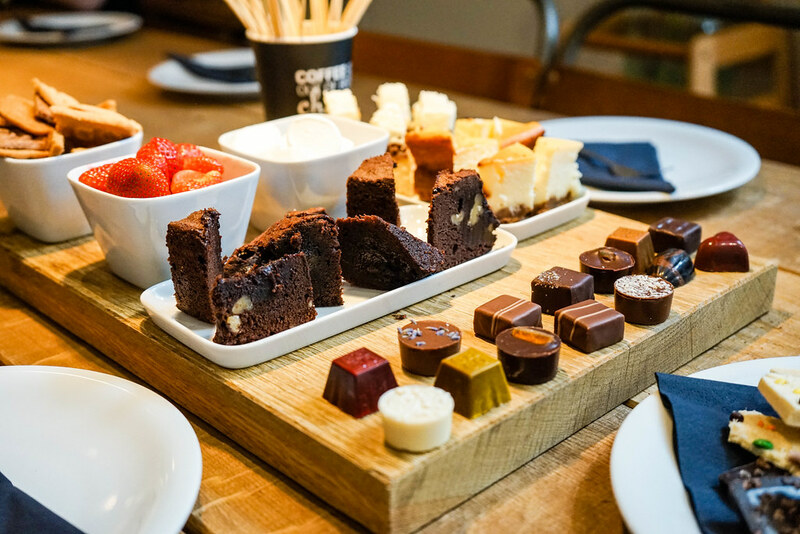 The Chocolate Company doesn’t only do hot chocolate, they also have a delicious selection of pralines, cakes and pastries. You can also have lunch here and enjoy a healthy salad or a freshly made sandwich. 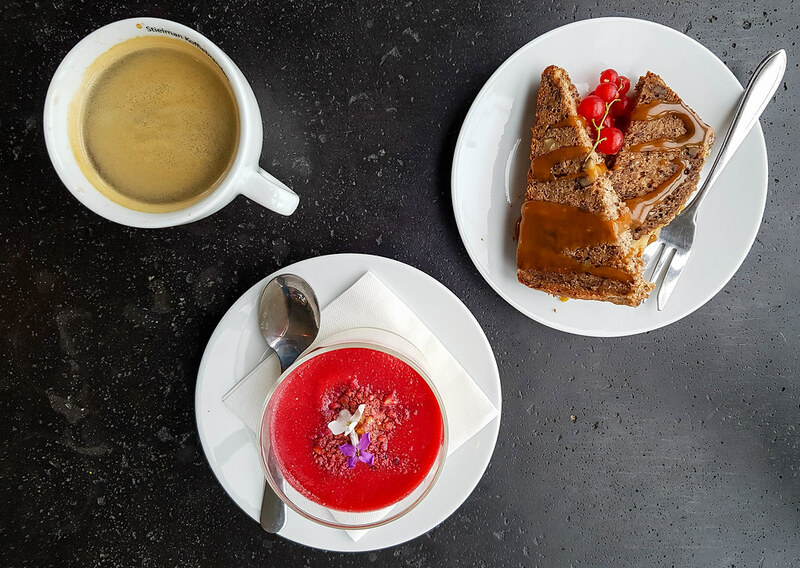 Are you looking for a romantic cafe in Rotterdam? Search no more! At the CHCO Café you can treat your loved one with a chocolate fondue served with fresh fruits, marshmallows and cookies, for only 11.50 euros per person. I have tried a mixed platter of pralines, cakes and biscuits, of which I couldn’t get enough. You know when you are full, but you still want to taste cakes because they are so delicious? That was me in front of that platter! The killer brownie was among my favourites, so rich and gooey, with big chunks of nuts inside. The baked cheesecake was delicious as well. I left the store with two other spoons of hot chocolate to make them at home, a delicious apple strudel and an intriguing cookie coconut flavoured one. They also cater food intolerances so if you are gluten or lactose intolerant, there is a hot chocolate spoon that tastes the same as chocolate but without any harmful ingredients. On a hot summer day this is the place to find the best ice cream in Rotterdam. 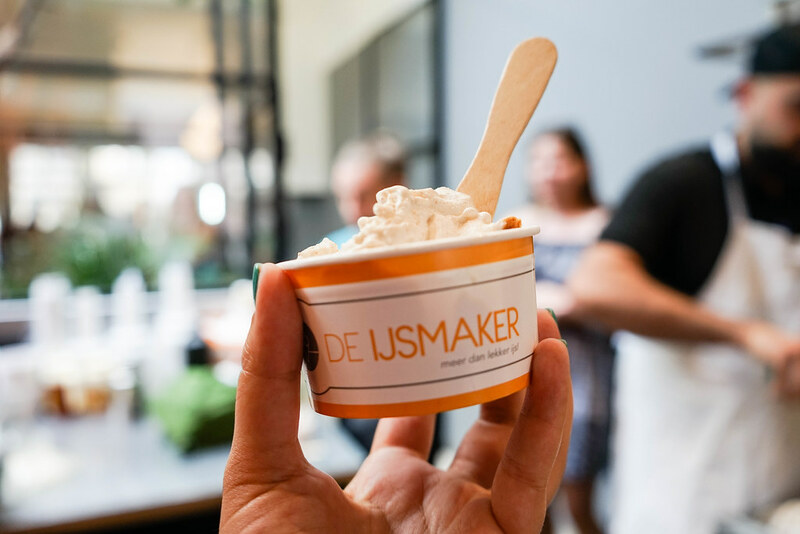 Made only with natural ingredients, the ice cream from De Iksmaker on Witte de Withstraat is always fresh, made daily. The ice cream is so good, creamy and full of flavour! The owner says that if it’s not natural, it doesn’t go in, so you won’t find here weird flavours like bubble-gum or jelly beans. I had a sneak peak into the lab and seen how they make the ice cream and for us, they decided to do stroopwafel flavoured one. Inside the creamy mixture went smashed pieces of stroopwafel delivered the same day from the food market. These are the stroopwafels that break and can’t be sold, so they are repurposed for other dishes. I can’t even describe how delicious the ice cream was, with the crunchy texture of the stroopwafel and its sweet taste. I did go for seconds! After walking around Rotterdam the entire morning, I decided to rest for a bit in the park next to the Markthall. Many people seem to do this, sit down on the grass and eat their packed lunch in the sun (if lucky). 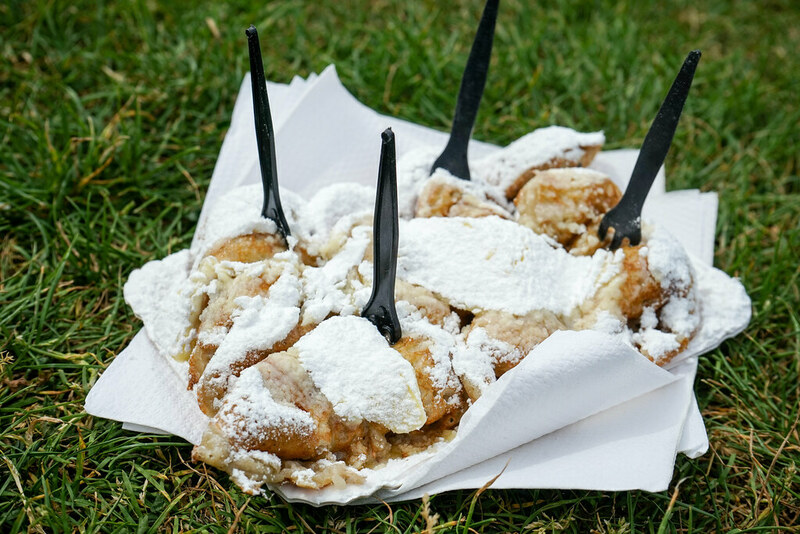 As the weather was gorgeous, I popped across the street to Poffertjessalon and bought a portion of Poffertjess to go. When in The Netherlands you have to try at least once the typical Dutch tiny pancakes called poffertjess. Light and fluffy, dusted with powdered sugar, these little pancakes are a proper treat. At Poffertjessalon this treat is still prepared in the traditional way, following a long-lasting family secret recipe. If you have the Rotterdam Welcome Card, you can even enjoy a discount of 50% for your order. 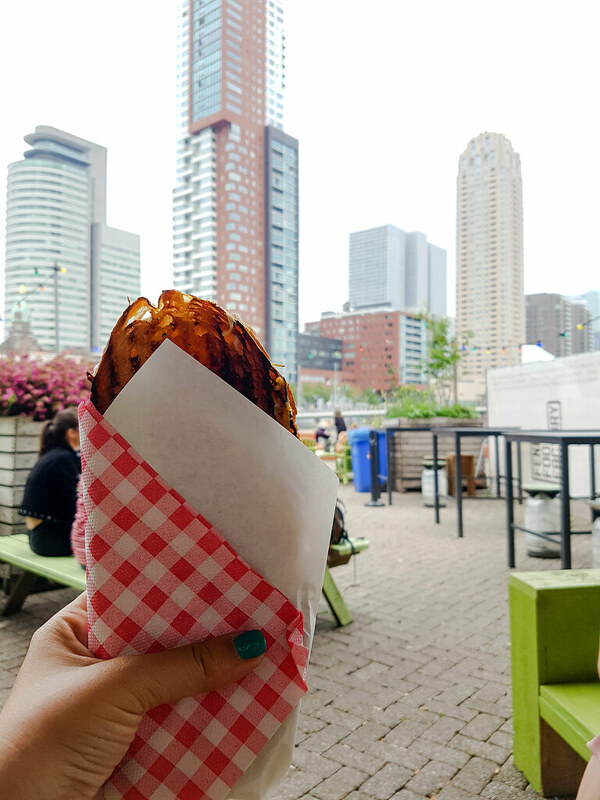 The Markthal is a must-see Rotterdam attraction when you visit the city, especially if you are a foodie. You will find a lot of Dutch specialities here, such as Gouda cheese (with different flavours – I do recommend the pesto one and the red peppers one), freshly made stroopwafels, fresh smoothies and, of course fries. First of all, let’s talk about the building which houses the Markthal. Built in 2014, the Markthal has been designed in the shape of a horseshoe, with a glass façade on a cable structure, which makes it the largest this type of structure in Europe. Inside, 100 stalls are selling delights for foodies, with a large supermarket in the underground. Above, there are 228 apartments, inhabited. In the underground, one can visit for free the archaeological remains of the 14th century Polder of Westnieuwland village, which has been discovered when the building site started for the Markthal. Return in the evening to admire the 11,000 square meters art installation designed by Arno Coenen using digital 3D techniques on 4,000 aluminium panels. 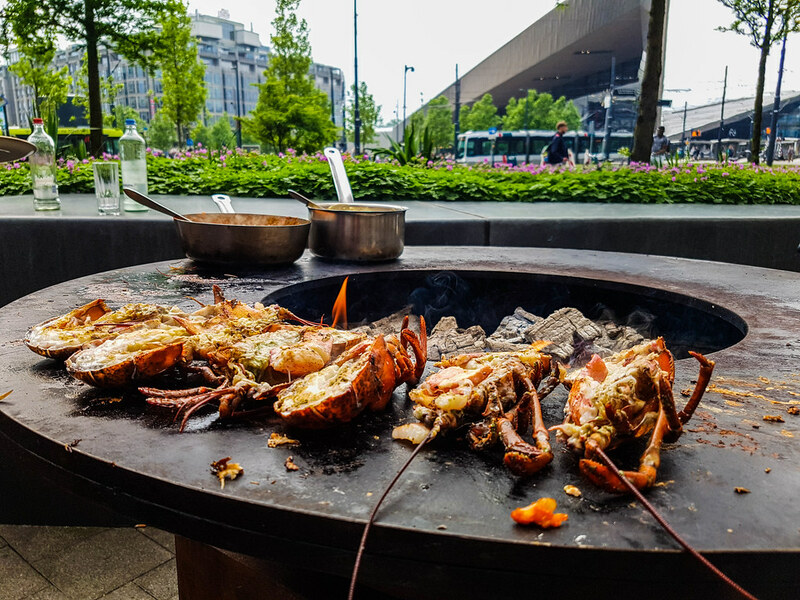 One of the main reasons to visit the Markthal is to eat! And one of the best typical Dutch things to try here are the fries. 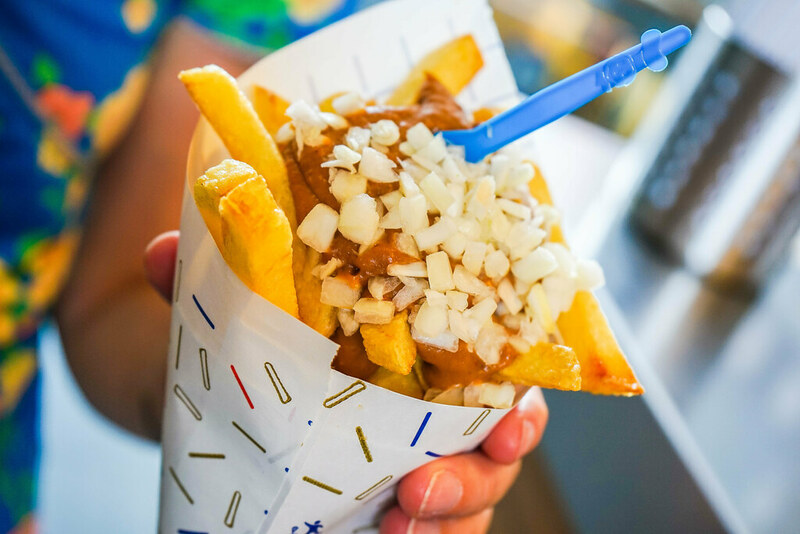 It might sound like a strange combination, but in the Netherlands, the fries are eaten either topped with mayo or with a savoury peanut sauce – similar to satay. Or with both. And then topped with onions. 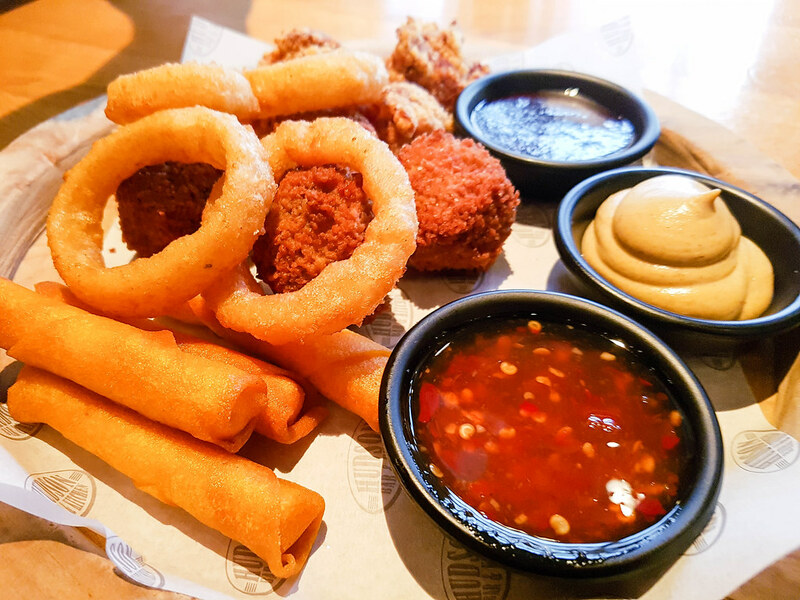 The combo is delicious and full of flavour, and I still remember the sweet, tangy and a bit spicy taste of the fries. If you are an adventurous foodie, definitely try the Dutch fries! Fenix Food Factory is located in Katendrecht, the hippest neighbourhood of Rotterdam. Once the red light district and Chinatown of the city, Katendrecht has transformed into a place where everyone wants to live, with many delicious foodie stops. One of them is Fenix Food Factory, home of delicious burgers, tacos and noodles stands, Moroccan flavours, cheese shops, a fresh vegetables grocery store, a butcher and even a micro brewery. Fenix Food Factory is the kind of place where you walk in, decide what you want to eat, buy it and then take a sit at one of the numerous indoor or outdoor tables to enjoy your food. A unique way to taste different delicacies from different stalls is to buy the “foodplatter”, which gives you the opportunity to walk around the stands and choose a number of different dishes. The platters are available only during the weekend and they cost between 12.5 euros and 15 euros, depending on the time of the day (breakfast is always cheaper). The sellers in Fenix Food Factory are all entrepreneurs and small businesses who make their own products in small batches, using traditional flavours. I went there for a quick lunch, so I opted for a delicious sandwich from Jordy’s Bakery and half a pint of experimental beer from Kaapse Brouwers. Roze koek is, at the translation of the name suggests, a pink cake, which I discovered after receiving a recommendation from Amber, the owner of 2 Glimpse, who was kind enough to take me on a local tour of Rotterdam. Roze koek is mostly sold in supermarkets and this is why we went to Hema – a large Dutch department store, to try it. Hema is a discount retail store very popular in the Netherlands, that sells all sorts of cool looking items, such as houseware, clothing and cosmetics. They have their own self service restaurant, where we tried this roze koek. The cake itself is made out of a lemony sponge, topped with a pink raspberry icing. Whilst the sponge itself is not very sweet, the icing is, which gives the roze koek a nice balance between flavours. What do you think? Which of these restaurants you would love to have lunch or dinner at? 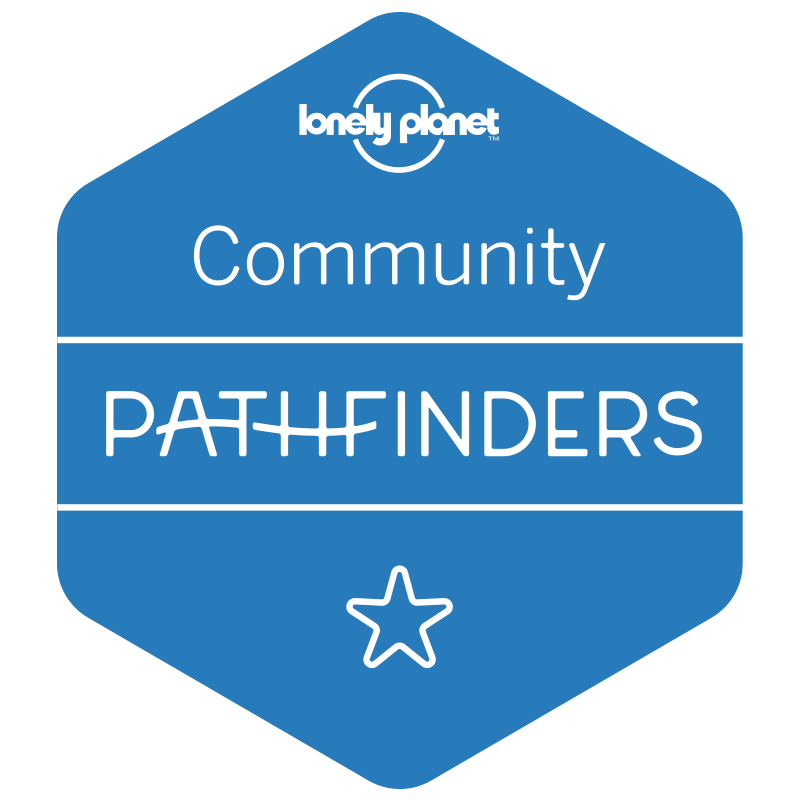 Have you been to any of them already? Let me know in the comments below! I really need to start looking into European traveling! Rotterdam sounds right up my alley with all the yummy food!! Great restaurant round up. I’ll be travelling back to the Netherlands this year, so this is perfect to refer to for dining options in Rotterdam! Wow, this all looks so good!! I love trying out new foods in different places. Until now I didn’t about Rotterdam. But this post definitely makes me want to add to my travel list, a lot of the food choices looked yummy. Oh my goodness I want to go to them all! Like WOW what an absolutely amazing collection of places to go for a bite to eat! I would love to go to Markthal in particular as not only does it sound like they do some local delights but also the building sounds lovely too. Everything about this has me itching to visit Rotterdam. One of my favorite parts of travel is finding new eats! The Netherlands have always been on my travel list and Rotterdam sounds lush! The food looks delicious! Great places, those burgers and fries had me sold. I need to find good places to eat like these ones. I love to eat, so this is my kind of post. All of this food looks incredible. I need to get to Rotterdam one day. I don’t even know where I’d want to go first. Maybe Bazar since it’s so pretty? I probably shouldn’t have read this post on an empty stomach because now I’m STARVING! Thanks for sharing! all of this food looks so good! 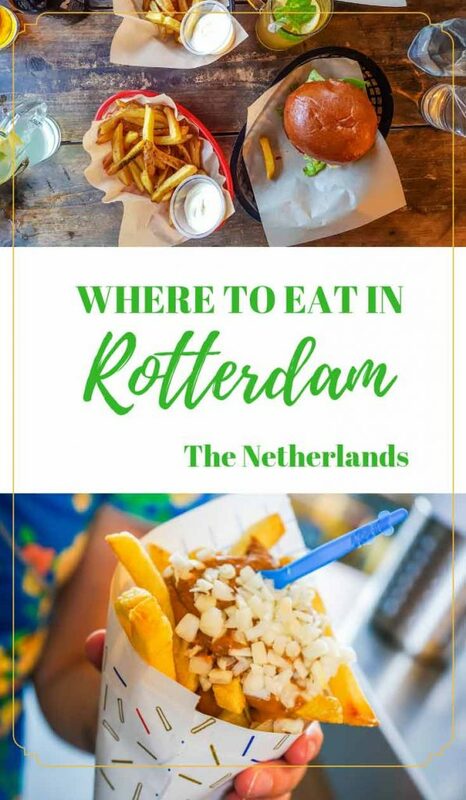 I have never been to Rotterdam but it looks like I know where to eat when i do go now! i remember the first time i was in your blog. 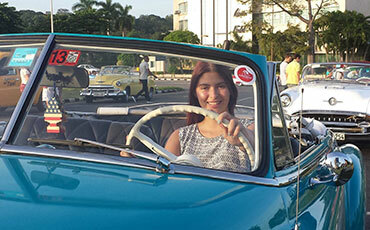 i love how you narrat your travel experience. reading your new adventure reminds me that youre one of my most loved travel blogs. your narratives are so detailed. I have been to Amsterdam and never make it to Rotterdam, it was a pity as it is such a rush tour. It’s interesting that the name in Nevertherland always end with “Dam”. Anyway, I love your list of food to try in Rotterdam, my top pick would be Fenix Food Factory as it look like more affordable and suit my budget. Most importantly, the food look so interesting and not easy to find in Asia. Roffa Streetfoodbar looks like it would be delicious and relaxed! Perfect for the end of a long day of sightseeing. Roots would truly make a fantastic date night. The foods are too good; they look supper delicious! I would love to eat at Millen Restaurant and at the Street Foodbar since I love burgers! The Roots at Hilton is also amazing! It looks like there are plenty of great places to eat in Rotterdam. Finding the best places to eat when travelling is very important to me. Dutch food is so interesting! I love it! Millen restaurant looks awesome i’d love to try this. As a girl from Rotterdam I know a lot of places you’ve wrote about. But there are also a few I didn’t know yet, so they will be on my list to try out. If you ever come back here, be sure to have all day breakfast at Lillith or go to Backyard. Also the roze koek you mentioned isn’t a roze koek, it’s called a tompouce and Hema is famous for their tompouce, they don’t sell roze koeken. 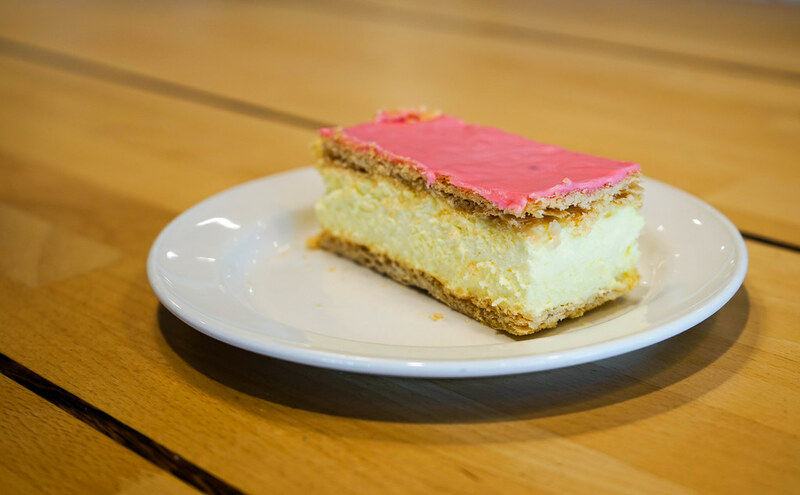 A roze koek is actually a cake like cookie with a layer of pink frosting on it. What lovely suggestions to try out if passing by this way. The fries at Markthal sound really interesting! The Markthal will be my first stop for sure because of the tons of food available. I love the photos of the food and how you have described in depth each of them. It’s my dream to visit the Netherlands and Rotterdam looks so incredible. All these restaurants are so amazing, with delicious food with great views! I loved the idea of Restaurant Gare du Nord, so fun!! Oh my! What a delicious looking post. Finger licking good. I still have not been to Rotterdam and I should have gone a long time ago seeing that it is so close. I would love to try a portion of those dutch pancakes. I really just travel solely for the FOOD so I appreciate this summary of places to eat! 😉 I am all about that grub! ha! This is truly a mouthwatering post! I didn’t realise Rotterdam had so many great places to eat. With my sweet tooth, I’d head straight to the Dutch pancake place. They looks so good, plus it’s a local food too, which always appeals to me. I’ll know where to go when I’m next there. I think I just gained about 10 pounds just from reading about all that delicious food! It all looks so amazing. Awesome! this post is so resourceful for us as we are planning a trip to the Netherlands. Oh my gosh, my mouth is already drooling! i can’t wait! Looks like a nice set of restaurants to try during weekends. Nice reading your guide about the way to enjoy them to the fullest. Am a foodie and the food really got me. My husband is planning a trip there would share this with him. Everything looks incredibly delicious! I would love to visit all those great places and try the food. Amazing! I would love to go there just for the food! My husband and I love trying new cuisine from all over the place! When I visited the Netherlands all I ate was chocolate and pasta. Now I’m starting to see I really missed out! These photos are making my mouth water. I want to visit Rotterdam so badly. It would be such a beautiful place and these pictures really showcase that. Also, the food looks so amazing!!! So many cool spots! I was recently in Amsterdam but didn’t have time to visit Rotterdam. Would love to return! Those cake topped with peanut butter or chocolate made my water mouth. I love going to Bagels & Beans (in several cities in the Netherlands). Definitely my favourite place to go for a bite! Never look at these post if you are hungry haha. They all look so appetizing and delicious to eat. Ok I want to eat all of this right now! And the chocolate cafe.. I want to move in haha. I love trying new foods when I travel, honestly that is probably what I do most. I always have a mile long list of restaurants and little spots to check out. Pining this for later! There is not one thing on this list that I would not eat. It all looks so delicious! I am funny about what I eat and where but I can honestly say I’d love to try all of these places. I’d start with Poffertjessalon because that looks amazing. I’ve never heard of Poffertjess before. I’m definitely bookmarking this as the Netherlands is on my bucket list this year for travels! Thanks for sharing! The Hudson and Roffa places really caught my eye! The food looks amazing! I have never been to Rotterdam. this post makes me want to go there now. I’d love to try all the good food! I’ve remembered my days in Rotterdam. Such a beautiful place to explore with families. But I have never been in that restaurants. Next time, I will be heading up and tried there delicious dishes. What a comprehensive guide! Impressed by the lobsters at the Marriott, Would love to eat at Gar du Nord! These foods are realling tempting. Clean pictures and amazing delicacies. Thanks for sharing. One of the worries we have about traveling with a child with autism is finding places to eat that will cater to his limited palette. There were a number of spots that I think he would have found their menus acceptable. Really good review and wonderful pictures. As I was reading it feels like you have taken me with you in Rotterdam. Cant get enough with all those foodies. Such an amazing places! My good friend lives in Rotterdam and I feel like I should visit her and take her to CHCO Café haha.